The Horror Section: Smokey Is Pissed. 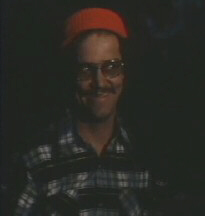 Last Thursday, I checked out the 1976 flick Grizzly. It was playing at the Toronto Underground Cinema, as part of the ongoing Exploitation Alley programme. An American forest range is terrorized by a murderous Grizzly bear. Grizzly is quite an entertaining watch. It starts off a bit slow, with heavy helpings of seventies cheese, but I thought it had a really solid second half. For a while, the bear attacks consisted solely of POV shots and puppeted bear claws grabbing screaming victims, to the point where I wondered if that was all it was going to be. 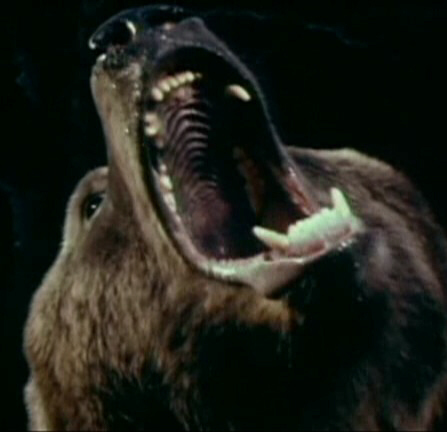 However, as the film progressed, there was actually a significant amount of impressive bear footage. Prominent in the mix was the score, which was incredibly upbeat for a movie of this type. It’s like the filmmakers said, “We want something like the chase scenes from Jaws… But peppier!” Speaking of Spielberg’s first summer blockbuster, Grizzly didn’t really try to hide the fact that it was cashing in on its success. In fact, it even featured a speech delivered by Stober (Andrew Prine), that mirrored Robert Shaw’s tale of the USS Indianapolis, about man-eating bears wiping out an entire Indian tribe. 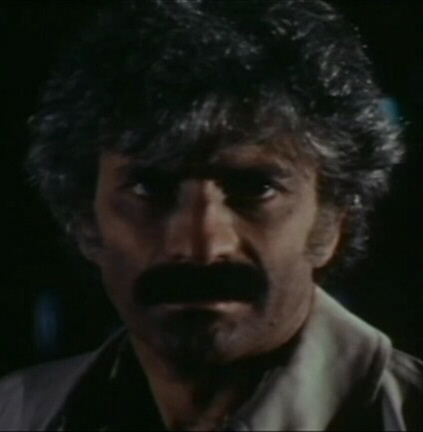 That said, I’m not going to play down the fromage in this movie. It’s okay though; it’s the good kind. Grizzly is populated with colourful characters, from the naturalist Scotty (Richard Jaeckel) who spends most of his time out in the bush covered in animal pelts, to Gail (Vicki Johnson), the bubbly ranger who thinks nothing of disrobing to frolic in the nearest river, whilst on the clock. That sort of thing doesn’t happen around my office – and for that I am thankful because it is ninety-five percent dudes. The dialogue is also often good for a few laughs, mostly when the chief ranger Kelly (Christopher George) clashes with his superiors. Another winning attribute is some of the unintentionally funny faces pulled off by some of the bit players. I find the poster kind of misleading. I was expecting the female characters to be more central to the plot, but if anything the romance aspect of the film is completely abandoned in the third act to stay on track with Jaws’ formula. It all leads up to an explosive conclusion that got a round of applause from all those in attendance. It was a fun night, made even better by this hilarious preview trailer for Three On A Meathook. I want this guy to narrate my day-to-day life! EPIC!